The Broncos won. This makes me happy, as both a native Coloradan and a lifelong fan of the team (I’m not the biggest fan, but I appreciate it when the Broncos win). Peyton Manning got another Super Bowl win, which makes me happy as well. When you’ve worked that hard for that long, it’s nice to have that achievement. I’d wanted him to have the same sort of finale to his career that John Elway did. Now he can. The game was not a particularly spectacular one. There were some great moments, but for the most part, I didn’t feel like I was watching two of the top-rated teams in the NFL. I felt more like I was watching a lot of people who were too tired to keep doing this much longer. This happens when you’ve got defense-focused teams. Von Miller was at the top of his game, and deserved the MVP award. The Broncos played pretty much exactly as I expected them to. The Panthers, sadly, disappointed me. I was expecting more of a team with only one previous loss in the season. Still, I look forward to watching Cam Newton’s growth as a player, and hope for the best for him and his career. Now for the rest of the Super Bowl-related things. The commercials and the half time show. The commercials in and of themselves mostly fell flat with me. I loved the sheep singing to Queen, though I question the need for a pickup with a stereo system in the bed, especially for ranching purposes (honestly, do you want to be loading feed and manure or what have you on top of your stereo equipment?). Coke did a great job with the Hulk/Ant-Man chase too. The half time show was amazing, with the exception of Coldplay. Bruno Mars? Great! Beyonce? Great! Coldplay? Eh. Anyway, I return you to your non-sports-related content until the 2018 World Cup, unless the Broncos get back into the Super Bowl next year. I have a snow day today. I’m not sure how I feel about this, considering that I was only on the schedule for a substitute shift (meaning I don’t get paid). Still, I intend to make the most of it. Right now, I’m finishing up Grant Morrison’s brilliant Multiversity and Claudia Gray’s Star Wars: Lost Stars. After that, maybe a quick revisiting of Gerard Way’s Umbrella Academy (because honestly, Séance is the best). Sadly, I can’t watch a whole marathon of Doctor Who, because Netflix has currently pulled it from their streaming lineup. I mean, yes, I have the latest season on DVD from work, but still. It’s just not the same, and I really hope it comes back soon. I can’t begin to describe the importance of Star Wars in my life. One of my earliest memories is of watching The Empire Strikes Back on VHS at my grandparents’ house, surrounded by my sisters and cousins. The Battle of Hoth, Luke’s encounter with Yoda, Lando’s betrayal… These are powerful moments in one of the most masterful science fiction films ever made. I would jump at any chance to watch the trilogy, since when I was very young, we didn’t own a VCR (we would rent one from the local Radio Shack or Video Den every few weeks, as a special treat). I don’t remember how old I was when I picked up my first Star Wars book. 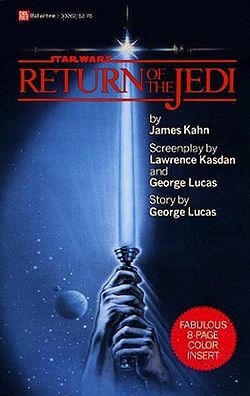 It was the novelization of Return of the Jedi, and I loved it. I still own it, in fact. Just came across it earlier this week. If memory serves, I found it by chance at a book sale at my hometown library. It may even have been the first novelization I ever read, I couldn’t say for certain anymore, but it was the starting point. I quickly tracked down the remaining novelizations and read them, eventually buying copies for my collection (one of my elementary school teachers had copies in her classroom, and I loved her for it). It wasn’t long after that that I discovered Kevin J. Anderson and Rebecca Moesta’s Young Jedi Knights series, focusing on Jacen and Jaina, Leia and Han Solo’s children. This was my first foray into the Star Wars Expanded Universe, and I couldn’t get enough. By jumping in to a story that was set over fifteen years into the future (post-ROTJ), I was introduced to characters and concepts that I’d never seen in Star Wars before. I had to find out more, and I set out to find copies of books like The Truce at Bakura, Heir to the Empire, and X-Wing: Rogue Squadron. Luke, Leia, Han, Chewie, and the others were all still around, having all kinds of new adventures, and it was a chance for the minor characters like Boba Fett and Wedge Antilles (and newcomers like Winter and Mara Jade) to shine. Decades pass, and new enemies rise and fall. Heroes are born and live bright lives before they die. It isn’t all perfect, but it’s amazing to see the sheer amount of content produced within the years since the Expanded Universe began. Some time ago, it was announced that the Expanded Universe would no longer be a part of the official Star Wars canon, being shunted into a parallel universe of sorts. The EU (no, not that one) will continue to exist as Star Wars Legends, but no new material will be created within it. All new Star Wars material will be written to align with the film canon. I’m torn on my feelings about this. I hate to see the work of so many talented writers be seemingly thrown out (except as possible inspiration for characters and events), but I’m thrilled that there are so many new opportunities for writers like Kevin Hearne and Chuck Wendig to get to write official Star Wars novels. I read Hearne’s book, Heir to the Jedi, a few months ago. I was intrigued by a chance to get a first-person perspective from Luke after the events of A New Hope, and I was not disappointed. Last week was Force Friday, the officially launch date of the merchandise for The Force Awakens. It also marked the release of Chuck Wendig’s first Star Wars novel, Aftermath. Reviews on amazon have been overwhelmingly positive for the first new-canon post-ROTJ book (with the exception of reviews posted by bigoted/homophobic trolls who can’t believe that diversity can exist within a sci-fi universe). I can’t wait to read it and write a review for you. For now, you can track down your own copy of Aftermath, or read any of Chuck’s delightful fiction or blog posts. Check him out here. The new canon of Star Wars is moving in very positive directions, toward a more diverse and inclusive galaxy far far away. While I am going to miss the Legends characters, I know that they’ll still be where they’ve always been, waiting for me to pick up their books. The Star Wars universe you love is not going away. It’s just giving new people their well-deserved time in the suns.